I use the mist after clearning my face in the morning. Spray onto face at a distance of about 15 cm. Pat gently until the mist is fully absorbed. Another way to use it is to spray on a cotton pad and pat on my face. I purchased both from Bonjour HK for $68 HKD (Approx. $9.50 CAD) each bottle. You can find both at Pacific Mall for about $20-25 CAD. Both are sold at approximately the same price. The mist is 250ml and the lotion is 200ml. Both products has ingredients such as micro collagen of 1000mg, hyaluronic acid (my personal favourite), honey and acerola extract. All ingredients are extremely moisturizing, helps skin look supple, and can enhance the skin's elasticity. I'm very impressed with the ingredients in this product line. The scent reminds me of lychee. 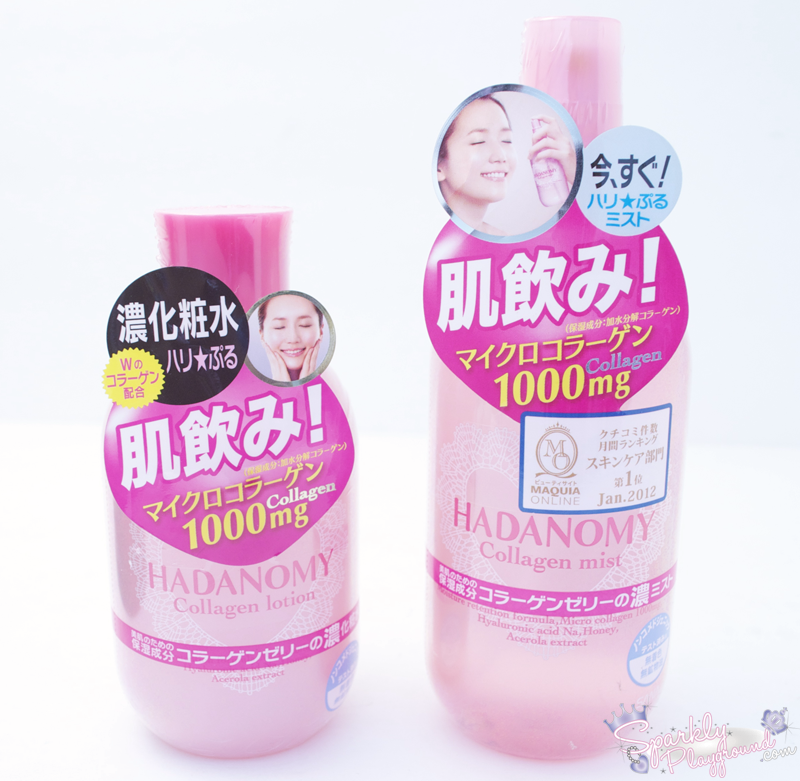 I'm always on a hunt for good toners/lotion (Japanese calls it lotion when it's toner). The mist is surprisingly very moisturizing. The spray gives off a very good amount and it sprays evenly, great pump (most likely reusing this bottle). I tend to use about 5-7 sprits because I like to use more than enough on my face. My face absorbs it very quickly and it feels fresh and a little sticky afterwards. Many people didn't seem to like the stickiness but I love it. The stickiness is not gross, it was a feeling of very hydrated skin. I find that the lotion has a really cool consistency and texture. It's gel but once you rub it with your hands, it's almost like liquid water. It's more moisturizing than the mist as it is thicker. The after feeling is more sticky than the mist which I'm okay with because I'm very dry and this does help me moisturize and I didn't break out from it. However, some bb creams and make up did not apply well after using this lotion. Overall, I think that these two products are worth buying for the summer daytime because it is moisturizing but I don't think it can beat the strong moisturizing products I have for night time. I also think that it will not stand the winter dryness here in Toronto. It may also be a just right product for oily skin but you may want to start with the mist to see first. Many MUA in Hong Kong and Japan highly recommends the mist. I personally like both. I do need to apply other creams and lotions after these two items as part of my skin care routine. In comparison to my JUJU Aquamoist Hyaluronic Acid Moisturizing Toner (Collagen), I would prefer the JUJU one. They are excellent skincare for me also because I test out several products a day and I need to cheaply moisturize my skin after cleansing. These products are affordable and hydrates my skin quickly for the next make up look.